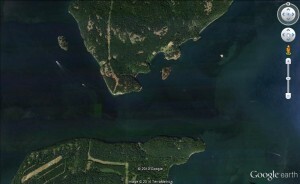 Arguably the busiest access into the San Juan Islands, Thatcher Pass is almost due west from the last buoys in Guemes Channel. Thatcher Pass is a busy route for Washington State Ferries. As with other commercial vessels, pleasure boaters are expected to stay well clear of ferry traffic. Keep a constant watch. Simply because there wasn’t a ferry boat coming up astern a few minutes ago doesn’t guarantee that a fresh look aft won’t reveal an approaching ferry. Especially in an era where many boats capable of running much faster are running on a slow bell to save fuel, a ferry turning 20-knots or more can overtake with surprising rapidity. Once inside Thatcher Pass, some boaters throttle up substantially. Unfortunately, at what might be the end of a long day and with Rosario, Friday Harbor, Fisherman Bay or Roche Harbor “almost in sight”, a few eager skippers are less mindful of their wake than they would be in their better moments. Slow boats should be mindful of any huge cruisers approaching, and aware that in the relatively narrow channel and with other traffic to consider those wake-makers will likely pass close abeam. Currents in Thatcher Pass average less than half the speed of currents in Rosario Strait (0.4) at maximum flood, and are about the same as currents in the strait at maximum ebb. (0.9). The pass turns to flood 43 minutes later than Rosario Strait, reaching maximum flood 1 hour an 1 minute later than the strait. Ebb begins 1 hour and 26 minutes later than Rosario Strait, and maximum ebb is 51 minutes after maximum ebb in the strait.